This weekend is my meetup at the Sigma store in the Mall of America!! I'm so excited! Click here to RSVP to the event if you haven't already! (it's Saturday from 1-3pm). If you're planning to come, Sigma does advise you to arrive a little early. I've gotten questions from a number of people asking what Sigma products I'd recommend since it'll be their first time visiting the store! If you come to the event- several of my favorite kits will be given away- so there's a chance you could score one for free! I always tend to talk about brush sets for those who are just starting out. I love the Essential Kit for a great range of basic brushes (I got my set years ago & it's still going strong! ), and if you get it in the Make Me Classy form, you also get the great storage cups. I love the Synthetic Kabuki kit and Synthetic Precision kit for cream or liquid products from foundation to concealer to cream bronzer, and the list goes on! But as far as more individual products go- I thought I'd offer a few specific recommendations in this post. That way if you're just looking for something special but not an entire kit, you have some ideas! :) By the way, I am a Sigma affiliate but it was my idea to write this post and these are my own, honest opinions as always. If you're a fan of using a cream base for your powder shadows- this is a great basic selection to have! This kit also comes with an F70 brush. 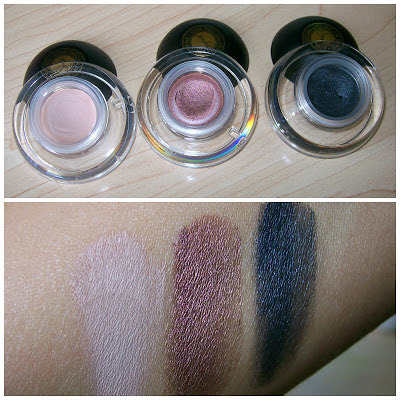 You get Persuade (matte cream color), Pose (shimmery brown/taupe), and Sculpt (charcoal). Persuade is such a great neutral because it makes any shadow- light or dark- pop on top of it. Pose and Sculpt are wonderful if you're trying to lay the foundation for a smokey eye. I think Pose is the prettiest color out of the whole range of bases. Keep in mind- for the best staying power you need to set them-- they can tend to crease if you wear them alone. This might be my current favorite single eyeshadow. This one was originally part of the Resort Palette (click here to see my post on that). I remember talking about it on Beauty Broadcast Live a couple weeks ago- I paired it with my matte white & cream Milani singles as a "transition" shade in the upper crease. 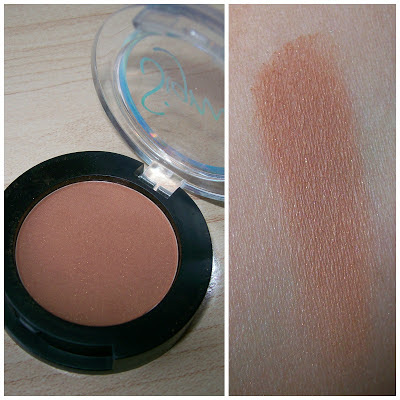 I LOVE the burnt orange tone of this shadow- it provides beautiful warmth and blends flawlessly. You might notice a hint of shimmer in this, but I NEVER notice that when I use this on the eyes. Such a great basic color to have! This is my rediscovered favorite!! If you saw my Kat Von D Ladybird palette tutorial, you know I've kind of got a thing for oranges right now! So I'm glad I pulled out this palette again because it's loaded with pretty orange and coral shades, along with yellow and plum! It also come with a double-ended brush. If you compare the Topaz shadow to these orange/coral shades, you may notice that Topaz has more brown in it, and these are more on the orange side. 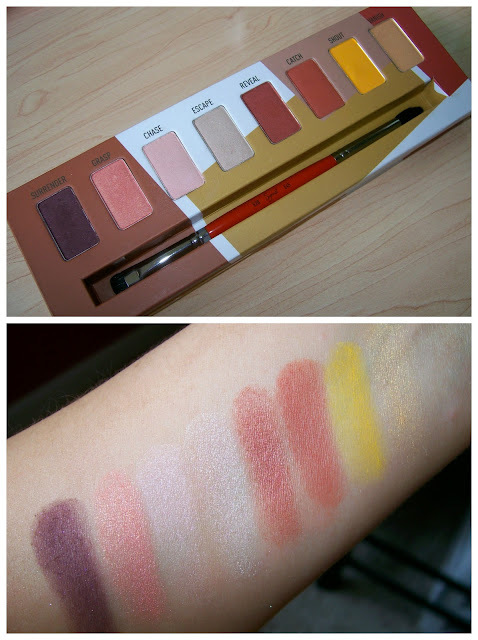 So if you want to branch out, I think this would be a beautiful palette to use for summer and it would definitely transition nicely into fall! This is my favorite brow product from Sigma's line. This is a very cool-toned brow duo that I think is pretty darn universal (though they do sell other color options). While I've worn this, I don't talk about it as much because it now lives in my kit for doing makeup on others! The lighter shade of this duo is great on blondes or brunettes... it's kind of strange, but it totally works! 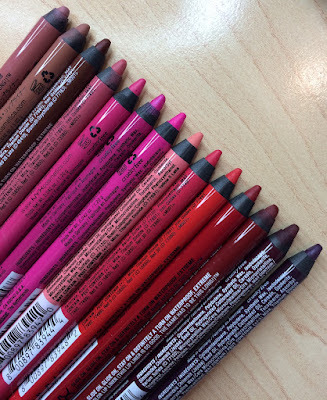 I have a clear wax pencil called Brow Fix from Anastasia, and if I'm using any sort of brow powder, I'll apply that pencil over the brows first to make sure everything stays in place. I know everyone has their favorite method for cleaning brushes (to each their own!)... and this is mine. I love using this- then drying my brushes in my Benjabelle brush tree (that thing is fantastic!) I've continued to use this mitt ever since I first got it and I love it more and more all the time. I use this along with my Sonia Kashuk brush cleanser. There are two sides to the mitt-- the face side has larger grooves (to work with your larger brushes), and the eye side has smaller nubs. 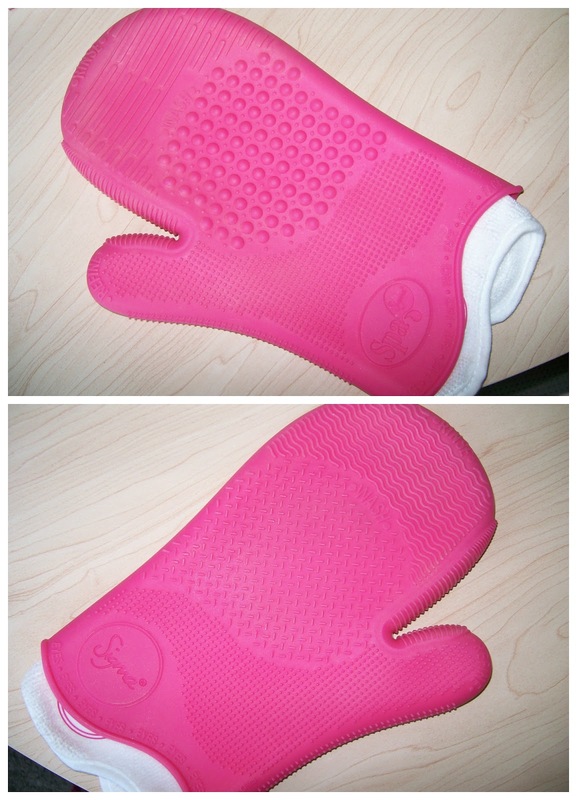 It also has a microfiber mitt that keeps your hand nice & sweat-free on the inside, and it comes out so you can wash it separately. The more I use this mitt, the more I realize how specialized the function really is. I would primarily recommend this to people who have a LOT of brushes- because it speeds up the cleaning time so much. The nubs agitate the product out of the bristles better than cleaning gloves I've tried that have less texture. And I really love the grooves at the top-- as I rinse under the water- I can see whether or not the water is running clean through those grooves. -Sigma F80 Flat Kabuki ($18, sigmabeauty.com) This also comes in the Synthetic Kabuki kit mentioned above. Love this for buffing in foundation- this is the best brush in that synthetic kit for working in circular motions, and it's large enough to give you a very quick and even application. -Sigma P80 Precision Flat ($16, sigmabeauty.com) This one is in the Precision kit- and this is my go-to for concealer. It solves the problem I had with my finger tips when I would "overblend" products to where I was basically wiping them away. This applies just the right amount of pressure to blend and cover! -Sigma F35 Tapered Highlighter ($18, sigmabeauty.com) This has been one of my most asked about brushes in recent videos- I use this for highlighter or targeted powder applications (like when I only want to apply powder to my t-zone). This could also be great for concentrated contouring. -Sigma F15 Duo Fibre Powder/Blush ($20, sigmabeauty.com) Love this brush for light applications of basically anything! :) Great for really soft highlighter or blush, but lately I've been using it with my more "glowy" bronzers for a summery finishing touch. -Sigma E25 Blending ($10, sigmabeauty.com) LOVE this brush. It's pinched toward the top, making this a great brush to apply shadow from side to side throughout crease, or turn it more vertically to buff out shadow. You see me using this all the time in my tutorials. And yes, it needs a bath too! -Sigma E21 Smudge ($10, sigmabeauty.com) I'm so glad this brush is available individually now! This is the perfect brush for smudgy liner, as I explained in this post on smudge brushes. I know it looks teensy next to the Blending brush, but it really has the perfect thickness for smudging out a pencil liner or applying eyeshadow as liner. It's also important that a more precise brush like this doesn't lose it's shape after cleanings, and this one really hasn't frayed out on me one bit! I did a very long-wearing, full coverage look for a commercial shoot I was on today-- I put it on almost 9 hours ago and it's still going strong! I'll blog about it soon. Humidity is here! omg. Thank goodness for air conditioning. 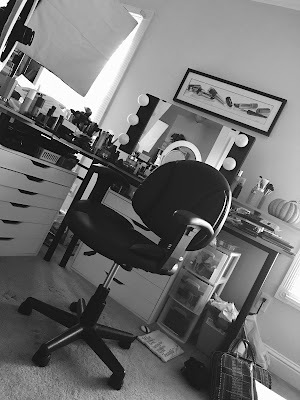 Tomorrow's blog post will show up on the Ladies' Home Journal Gloss Daily blog, FYI! Have you ever seen those Dateline on OWN (Oprah's network) shows? I got sucked in last night. Wives killing husbands, husbands leading fake lives... so much tragedy and drama! I can't wait to meet you on Saturday!! My daughters are excited too! Everything looks so so fantastic! I cannot get over how gorgeous those base shades are. Amazing! I love sigma so much!!! Wish I could meet you, Emily! If only you were doing a Nashville meet-up! Wish I lived closer to the MOA, but I still hope to meet you one day! I hope you have the most amazing time at your meet and greet Em!! You deserve all the love in the world. If only I lived a little closer....ok ALOT closer... I would love to meet you. Congratulations on all your success! I wish I could meet up with you since I live so close!! (Wisconsin) But will be there July 27-31 with my husband as he has a conference. I get to shop at the Mall of America!!! Sigma will definitely get a very large amount of my spending money!!! Have a wonderful time next weekend!! this post was great! but I wish that palette didn't have the bright yellow because I'd never wear that shade. Wow, that looks really gorgeous and I really love that color and it's good for a party makeup. never tried sigma brush essential kit before but it looks nice! So excited to meet you on Saturday! I hope Tyler is still coming because my boyfriend will be there and need gender support! haha I already have a list of what I want to purchase at Sigma! YAY!!! I really wish I could be at the meet up, but I have a wedding shower to go to. :-( I'm really sad I can't be there!! Good luck though!!! Urgh, I forgot about the meetup. Why oh why must it be my brother's birthday? Ah well. To everyone who's going, have fun! wow this is so lovely and great makeup brushes. Very informative post! I now have a clear mind which ones I need to pick!